Fabric Mart Fabricistas: Made by a Fabricista: Hawaiian lawn print sundress + silk taffeta dress! Made by a Fabricista: Hawaiian lawn print sundress + silk taffeta dress! Hi everybody, it's Virginie from Jazz Couture and I'm back this month with 2 new dresses! The first one, Marfy 6193, had been on my bucket list since the release of their Summer 2018 collection. I had envisioned many fabrics to make it, but when FM listed some Hawaiian designer fabrics not long ago I jumped on this beautiful print; I knew it would be perfect for the sundress I had in mind! 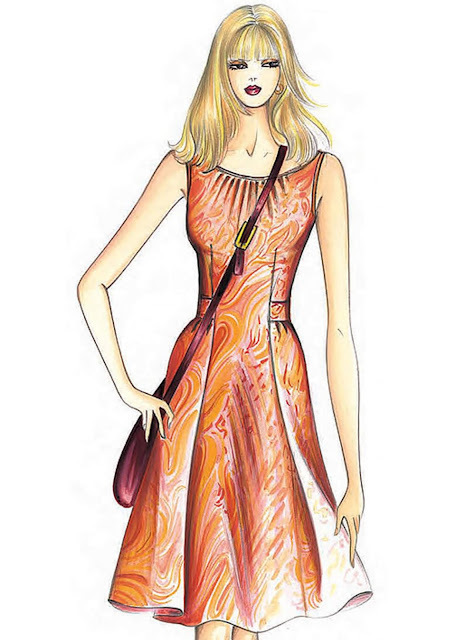 Marfy 6193 is another great dress pattern with details you don't see elsewhere. It features a gathered neckline which is bound with bias self fabric strips, the armholes are bound too, the bodice has front darts, an inserted belt, an overskirt with front pleats which continues to form the back skirt (no side seams) and a rounded low back neckline. The dress closes with a back zip. The cotton I used for my dress is made in Japan, as are many of the fabrics in the Hawaiian designer collection. I don't know for you, but 'Imported from Japan' is a strong incentive for me to buy, as Japanese fabrics are of high quality (and so are 'Imported from Italy' and 'Imported from Switzerland' fabrics, ha ha!). The quality was just as I expected when I received my fabric - it's a fine lawn, lightweight and silky, similar to Liberty if you have ever worked with the stuff. This particular print is now sold out, but there are still many more beautiful lawn prints to choose from in the collection. I'm glad I took 3 yards of that fabric to make my dress. Marfy yardage recommendations always seem pretty conservative to me, and just the overskirt is wide and consumes a lot of fabric. Don't forget you have to cut bias fabric strips too to bind the neckline and the armholes! Check out below how the print is matched in all the different sections! I made a size 42 (italian sizing), which is the smallest in Marfy's size range. This is the second Marfy dress I've made this year - like I mentioned in my previous post, Marfy patterns don't have seam allowances (which I appreciate 'cause you can add the allowances you prefer) and no instructions. I like to sew those patterns because the italian cut is just so well thought and wonderful, and as a plus it's fun to figure out the construction and it's a good exercise for the brain! I strongly recommend making a muslin for this dress, 'cause there are not many places to alter once the dress is made up. Even after testing the pattern with a muslin, the dress came out slightly roomy for me and I wanted the bodice to be fitted, so I took in .5 cms from the bodice side seam (tapering to nothing since the skirt has no side seams), and I took in at CB seam too. No other alterations except than adjusting the hem for my height. I spent a whole afternoon cutting the dress and carefully matching the print in all the different sections. I'm over the moon in how well the print is matched, but the counterpart is that with such a busy print the design details kinda disappear! Next time I want to make this pattern in a solid to make the seaming stand out. Finally, If you are afraid to tackle a Marfy pattern, I'd say get your hands on by making a muslin, then you realize (if you have been sewing for a while of course) that a dress is a dress, a shirt is a shirt, a skirt is a skirt in terms of construction, and it's really freeing to not have to stick to instructions while you sew! My second make this month is a silk taffeta dress. The pattern I used is a vintage dress pattern, namely Style 1528 (a long gone pattern company); I made this dress multiple times in the past and I could almost sew it in my sleep! When we think of silk taffeta we tend to think of formal garments, but did you know you can alter the hand and texture of silk taffeta to use it in a more casual way? FM currently has a great selection of silk seersucker taffetas; I used the raspberry colourway to make my dress. Untreated, this fabric has a crisp, stiff hand and quite a smooth surface. If you want to preserve it, sew your garment and take it to the dry cleaner to clean it. I wanted a casual chic dress, the kind I can wear for a night out on the town, so I hand washed my fabric in cold water and put it in the dryer. The colour stays beautiful, but the texture comes out much more supple and it has a slightly crinkled texture that is permanent - I like it a lot that way! Close-up showing taffeta texture after it has been washed and dried in the dryer! When your dress matches your shoes perfectly! I will confess that I chose this fabric in this colourway 'cause I wanted a dress to go with those sandals! Isn't it great that we sewists can do that sort of things? I will leave it there for now. I wish you lots of great sewing, and don't forget to check FM's blog twice a week. I think the Fabricistas are on fire these days and you'll find lots of inspiration by reading the blog! Me, back 2nd Wednesday of September - see ya! Both of these dresses are darling and I am really amazed by the silk taffeta. After putting it through a dryer and getting the texturing it seems to me that this would pack and travel well. Or am I wrong and it wrinkles? I hadn't thought of that, but yes once washed and dried it would be a good candidate for packing and traveling! Beautiful dresses, especially the first one. Thanks! 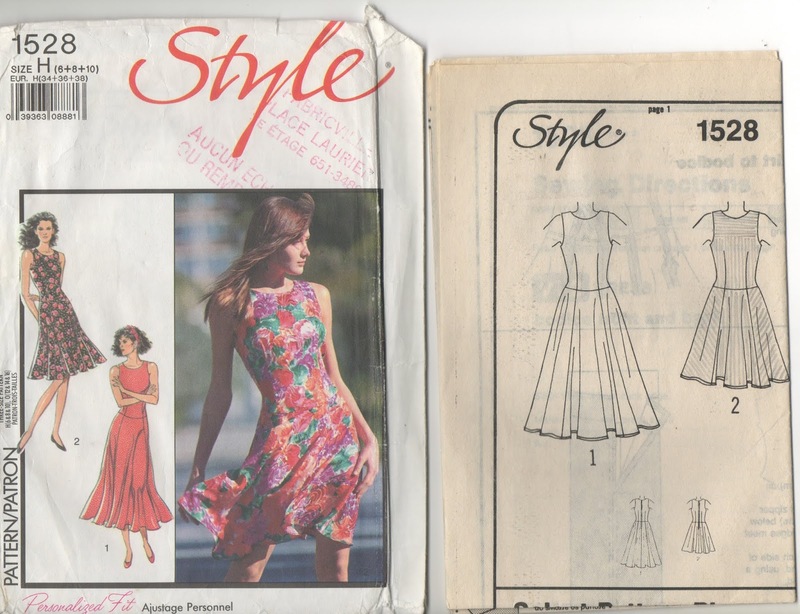 Like I said in the post the seaming details disappear with that busy print, but that is definitely one beautiful dress pattern and the cut is superb. OMG I wish I had known that about the taffeta! They had a really great sale not too long ago. Drats. Both of your dresses are beautiful! I have never taken the plunge on a Marfy; one day. The color on the pink one is just luscious. Very nicely done. Thanks! The taffeta is still on sale today - me, I'm grabbing some more! The texture changes completely once washed and dried, it becomes softer and more supple, well suited for less formal garments. I love your dress especially the color! You look fabulous as always. Too bad the pattern is no longer available. The simplicity of the dress and fabric is very chic and high end looking.